make a One-eyed, One-horned, Flying Purple People Eater game (see instructions for the game), They're thinking about making it a new olympic sport *grin*. use the craft to store small toys, small books or keep treasures safe (who'd dare try to steal your prized possessions from this nasty critter!) Do not store food inside it. 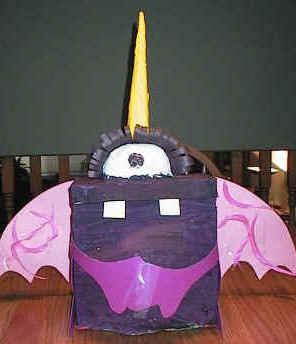 make a one-eyed, one-horned, flying purple PAPER eater and use it as a recycle bin! have older children (Age 10+) make the People Eater game for the children's hospital or special care facility. This would be a wonderful project to go do with the kids in hospital. The older children can pre-mache the project (up to the painting stage), take it to the hospital and help the kids paint and decorate their creatures. There are two versions for this craft. 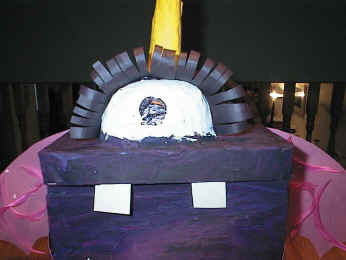 This, paper mache version, takes a few more materials and a bit more time to make. 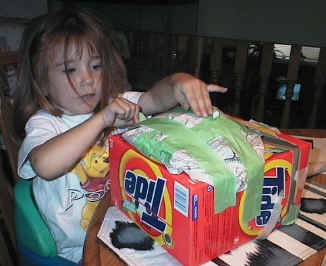 It's appropriate for older children (Age 7+) to make independently or younger children (Age 3+) to make with help. The easier version is not a paper mache craft and provides a nice short-cut option for younger children or large groups. 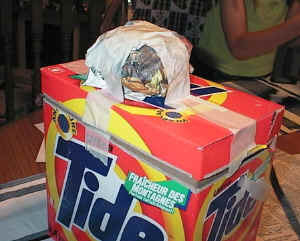 Tide (laundry detergent) box. Doesn't really matter what size you use, as long as it's the standard type with the flip up lid. paper mache (1 part flour to 4 parts water... bring to a boil while stirring. Take off stove and add 1 part really cold water and stir again (to cool it off so you can use it right away). paint purple (or mix blue and red together to make your own purple). We also used yellow for the horn, but you can use any color you like. We also used white for the eyes. If you don't have white paint, you could just paper mache the eyeballs with plain white paper and leave it at that. construction paper or poster board (for the limbs... we used pink, but use what you have). OR you can take plain white paper or cardboard from old cereal boxes and paint it for the limbs if you don't have the construction paper or poster board... or if you want this craft to be 100% recycled materials. In the instructions, I have included the "have to" steps in large print and the "optional steps" in smaller print. Older children may appreciate these optional steps to make a really big project. 1 part flour to 4 parts water... bring to a boil while stirring. Take off stove and add 1 part cold water and stir again to mix (to cool it off so you can use it right away). use sand paper to lightly sand the finish off box. This helps the mache stick a bit better, but it is not crucial. MAKE THE EYES: Take a sheet of newspaper. Crumple it into a big ball. Wrap tape (we used masking tape) around the balls to secure. MAKE THE HORN: Take a sheet of newspaper. Roll it into a cone. Tape cone so it doesn't unravel. Trim cone to the desired height (your horn doesn't have to be as tall as ours was). Stuff the open part of the cone with newspaper so the whole thing is pretty solid. Tape cone securely onto the top of the box, behind the eye. Make the tummy - this is not necessary, but I like how it looks. Take 2 or 3 pieces of newspaper and crumple them up. Tape them onto the front of the box like padding. If you want to disguise the box shape even more, you can pad the sides and back too (just don't pad too far up the back -- make sure the lid will still open!). You can also make a second cone shape (like you did with the horn) and tape it onto the back as a tail). We opted to tape on paper arms, legs and wings after the fact, but you can paper mache them too. Just roll sausages of newspaper and tape them on. You can even use bent wire coathangers with newspaper taped on to give limbs more form. Just remember, this is a pretty big project without all these extras! I don't recommend adding too much complexity for children under 8. This is where 10 thru 14 yr olds can have a lot of fun creating a customized creature!!! Tear newspaper into strips about 1 to 2 inches wide. You can have some that are longer and some that are shorter. 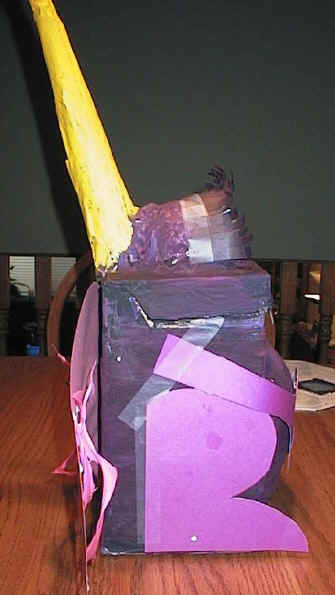 Paper mache the entire thing (you don't have to do the bottom of the box). If you're doing this with younger kids and accidentally mache the mouth closed, it isn't a huge deal as you can just cut it open again when the mache dries. You don't want more than 4 layers of mache added or it won't dry properly. I usually tell the kids not to add more than 2 layers (when they inevitably overlap things a bit more than they should, we end up with 4). Use shorter pieces when macheing around the eyes and horn if it's too finicky (or have younger kids mache the nice easy body and save the head for yourself). Let mache dry (set outside on a nice sunny or breezy day and it will dry very quickly). Apply a second coat of no more than 4 layers and let dry (one coat is enough, but the more coats you add the sturdier it will be ... especially if you've added mache limbs and tail). Let dry. Apply a third coat. Let dry. The very top layer of mache can be done with white paper towels or toilet paper. This will give the "skin" a rough texture and will make it easier to apply paint. Once the mache is completely dry, paint the body purple. Acrylic paint can by used by older children and does coat it a bit better. It's also water proof, unlike tempra paint. We used tempra paint (we mixed our own purple with blue, red and black powder plus water). We added the black as it seemed to make it coat a bit nicer. We only had to apply one coat, but you could apply more than one. You could spongepaint on a second layer or darker or lighter purple for a neat look! Or just do this to the belly with lighter paint. Paint the eyeballs white (or paper mache on white paper/papertowel/toiletpaper). Actually, you could make the eyeballs whatever color you like too (green might look nice!). 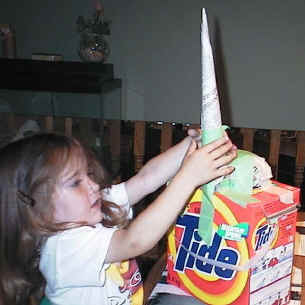 Paint the horn whatever color you want to. You can get crazy, and add stripes or polka dots to the horn. Put on the eye centers with black paint or marker. Cut arm, leg and wing shapes out of cardboard or construction paper. Tape/glue them to the completed creature. Older children can do a much better job of hiding the tape than we did (I had a 2 yr old helper who LOVES to tape!). Glue feathers onto the wings. Glue eyelashes onto the eyeball. Take a strip of construction paper and fold a 1/2 inch tab. Slit the strip every 1/4 inch or so all the way down to the tab. Curl around a pencil and glue to the eye.